Gillian Grogan is a wonderful friend and her songs speak to the soul in a way that is hard for me to describe with words. For the Redbird EP, we spent some time trying to get the feeling of being in the room with her, Otto and Chris of Honeyfoot as they recorded live, single-takes in the studio. To get a sense of space, Brian and I found a mic configuration that was 3 crisscrossed figure-8s. 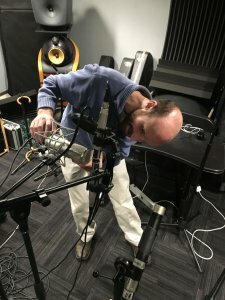 I’ll call it a “3D Blumlein.” The arrangement allowed us to capture the guitar in stereo while keeping the null of vocal mic (AA U47 clone) on the guitar. The result allowed us to have the vocal to sit a bit forward even though guitar and voice were physically close together. The sources were kept relatively time-coherent in comparison to a spaced out array, where it is possible to align the guitar or voice but not both. The method worked best on the title track, Redbird, where there was a lot of dynamic contrast. Take a listen below and find the full EP on Bandcamp, along with high resolution downloads.